Every once in a while, an idea, an audience and a client willing to take a risk conspire to create an opportunity to do something special for a brand. We were delighted to get the go-ahead from Ian Macleod Distillers on such a project for Glengoyne Single Malt Whisky. The idea was simple: showcase the global Glengoyne Customer Family by asking them to celebrate Burns Night through a reading of ‘Tae a Haggis’, to be released in time for the 25th January. Their contributions would be edited together to create a single reading of the poem that circled the globe. To kick things off, emails were sent to the Glengoyne Family database in late December 2015, asking them to contribute in the most passionate way they could imagine. We were amazed by the results! Family members from around the world donned their kilts, set themselves up and read their favourite verses of the poem with amazing enthusiasm. Submissions came from a snowy forest in Saskatchewan, from a sunny tennis club in Melbourne, from Sweden, from New York, from a warm New Zealand, from Taiwan, from the frozen Norwegian Countryside, from Germany, from Switzerland and of course from Scotland itself. Some of the Distillery team were kind enough to contribute as well. Editor extraordinaire Marc Grundy pulled everything together against a very tight deadline and delivered an amazing final film. We were delighted with the end result, as was the client. Just shy of 40,000 people were reached by the campaign on Facebook, the video was viewed over 22,000 times and – most importantly – we celebrated Robert Burns’ birthday in a way only the Glengoyne Family could. Enjoy! Google Testing 100%-Paid Local Profiles & Listings? Over the last few years, Google’s focus on Local Search and Local Business has undergone a huge number of changes, with perhaps the most significant being the shift to Google My Business, which took on the mantle of Google Places, Google+ Local and the other myriad personalities their Local product had adopted. What has remained constant throughout these changes is that the service is ‘free’ to the business owner. However, if some recent tests are anything to go by, that might be about to change, and Google might be looking to take a major slice out of the small business web site market. For many years Google has featured some sort of map-based listings in its organic search results, and over the years the format of the product, its name and its positioning has changed. Starting out as Google Places, the product has evolved and morphed to become in the most recent iteration Google My Business, which offers the business owner an ostensibly easier way to manage the profile for their business. The product is now tightly integrated with Google+, and from our experience is certainly easier to manage than it has been. Complaints abounded for previous iterations – business owners often found their details out of date, despite having updated them; claiming profiles for business was often a tortuous process; from time to time business profiles were hijacked and owners had to fight to get them back and there seemed little rhyme or reason to when, how and where these listings would show up in search results. Sitting against these changes are two broad market developments: firstly the decline of print-based local advertising and the growth of mobile. Looking at the first of those, for many years the Yellow Pages, or the Thomson Directory was the first port of call for anyone looking for a local service. Google’s growth and huge market dominance has – for want of a better description – utterly destroyed the Yellow Pages, leaving the old book format completely redundant. Whereas previously business owners could rely on the Yellow Pages to find customers and services respectively, nowadays Google is where people go, and Google AdWords has become the de facto source of business for many of these companies. As an example, I spoke to a locksmith in Edinburgh who happily (I’ll emphasise that: happily) pays Google around £600-£900 a month as it’s such a strong source of business. In a slightly ironic twist of fate, the Yellow Pages morphed to become Yell.com, and from there became Hibu, which offered to manage Google AdWords campaigns and build up web sites on behalf of small businesses – thereby feeding the very company that had destroyed it. The growth of mobile also plays an important role – users on mobile devices often use them to locate local services such as cafés, restaurants, service providers and others, and Google has worked hard to react to this. Search results are mobile-oriented, Ads are more suited to mobile devices and after Apple developed its own Maps product for iOS and Mac OS X, Google released an excellent Google Maps app which has a huge user base. The fight for eyeballs is clearly on, but what about the fight for revenue? As I’ve mentioned, barring AdWords, all Google’s Local products are free, and to me it has been something of a conundrum that Google has never really tried to monetise the product as – let’s face it – they are very good at driving revenue from practically every single other product they put out. There’s clearly a market out there, as hibu’s existence attests, and other players such as Johnston Press are getting in on the act in the UK, so why not Google? An eagle-eyed observer in the USA may have the answer: they recently noticed Google testing a completely paid-for set of Local Listing Ads, effectively turning a 100%-free product into a 100%-paid-for product. 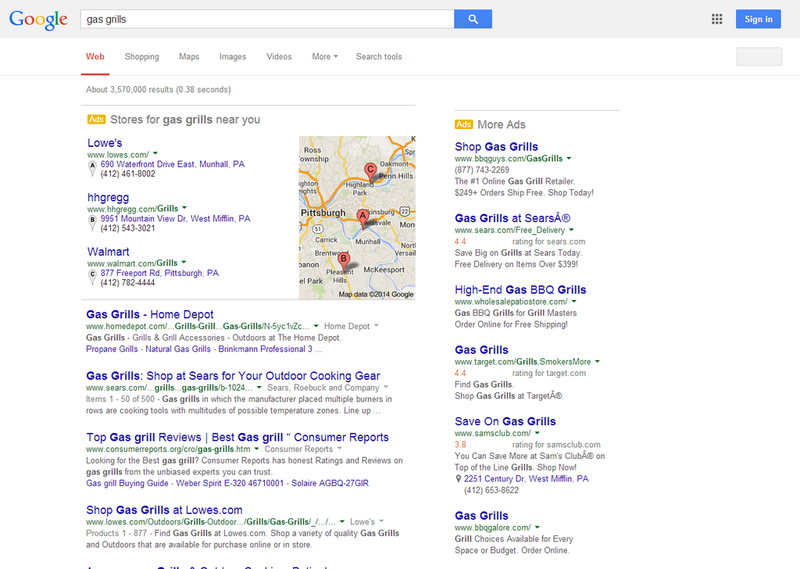 Cast your eye over the screenshot here and you’ll see three maps-based ads for ‘Stores for gas grills near you’, which features Lowe’s, hhgregg and Walmart. All three are ads, all three will cost the retailer if someone clicks. Of course, Google tests product variations all the time, so this on its own isn’t definitive, but if you consider some other recent developments and the language Google is using, we might be able to pick a path to a future where Google’s local business products become a substantial source of revenue, and the likes of hibu are squeezed even further. Yesterday, Google published an article on their Webmasters blog titled “Bring your local business online — no website required!”. The advice goes on to tell small business owners that they don’t need to set up their own web site, rather they can simply use Google’s products and others to gain a place on the web, market themselves, engage customers and grow. This of course is entirely true – it’s entirely possible to build a profile for your business using Google My Business, TripAdvisor, Laterooms.com, LinkedIn, Yelp or whatever web site or directory is suitable for your business and do well from it. However, and it’s a BIG however, if all these local businesses are using Google products to market themselves, and if a Google My Business or Google+ page becomes the central hub for a small business’s marketing, in my view it’s almost inconceivable Google will not want to monetise that activity, or in other words take a cut of the transactions and relationships that ensue. Google has already been enormously successful in its monetisation of web search traffic, and the huge recent developments in Google Shopping show both that there is plenty more to come in terms of innovation and there is also plenty more to come in terms of what will be free and what will be paid-for traffic. The search engine is superb at understanding what is and is not a commercial search query, so whilst I’m wary of making sweeping predictions, I don’t think it will be long before we see the same intelligence being applied to local business’ Google+ and Google My Business Presences, and business owners being given the choice of paying Google for leads, enquiries and business, or staying free and finding themselves relatively invisible on Google properties. Local SEO – End of the Road? An elephant in the room with all of this is the impact on Local SEO and those who make their living providing such services to local businesses. Clearly, if Google ’s Local Listings move to a 100%-paid model, the landscape will shift dramatically, and the ability of Local search experts to promote their clients may diminish, which in turn would reduce their income. This is a larger subject area, and worthy of a deeper exploration, so watch out for a longer blog post on that in due course. In the meantime, interesting times for all concerned! https://www.mackerelmedia.co.uk/wp-content/new_uploads/devices.png 366 975 Nick Craig https://www.mackerelmedia.co.uk/wp-content/new_uploads/MAC-logo-340-1-300x86.png Nick Craig2014-10-09 14:33:202016-08-17 21:22:48Google Testing 100%-Paid Local Profiles & Listings? I’m delighted to announce the recent launch of a project we’ve been involved in for some months – a new web site for The Chippendale International School of Furniture, based in the beautiful Haddington countryside, not far from Edinburgh. My first encounter with the school was on a dark, wet night in November last year when I ventured out to meet Anselm Fraser, the Founder and Principal, and Christopher Lamotte of Real Marketing, who led the project. Not knowing quite what to expect, I was completely amazed when I walked through the small round doorway into the warm, bustling workshop, where a full score of students were hard at work on their woodwork projects. Panoramic photo of a huge woodworking workshop? No problem for the iPhone 5s. Since then we’ve worked closely with Christopher and the team at Inigo Media to plan, design and develop the site. Built using WordPress, the site consolidates three previous sites into one, presenting a single international voice to the School’s highly varied international audience. Our role was plan a new structure, content and optimisation strategy for the site, working with the extensive data available. This also involved creating a plan for the merger of the aforementioned three sites (one for each of the US, the UK and Spain) into a single domain. The Chippendale International School of Furniture’s new website is much more international in outlook, combining our UK, US and Spanish websites all together in one larger international site. We have always attracted some international students, particularly from the US, however we want to significantly increase the proportion of our 22 students from overseas. The new website, built by Inigo Media, should appeal to students from all around the world, as well as from across the UK. The School has been a Scottish success story for over 25 years and is increasingly regarded as the UK’s leading furniture design, making and restoration college, especially for intense one year courses – with the support of the team at Mackerel Media we aim to build on this considerable pedigree, and ensure we have a stronger presence globally. Have a look at the site in all its brand-new glory at www.chippendaleschool.com. We’ll be publishing a regular Newsletter covering everything that’s happening in the world of digital marketing, SEO, PPC and anything else we can get our hands on. If you’d like to sign-up, please enter your email address into the form below. We won’t divulge your details to any third parties and you’ll be able to unsubscribe whenever you like. We’ll be delighted to speak to you. Our office is open Monday – Thursday – 9:00am to 5:30pm. We are VAT-Registered and Registered with the Information Commissioner’s Office.